The world is in shock at the grave tragedy in which twelve people were gunned down at Charlie Hebdo by Muslim extremists. The French satirical newspaper had published several cartoon caricatures of the Islamic prophet Muhammad over the years, many of them placing the prophet in scandalous or obscene positions. But that's not quite what Islam teaches. To be clear, there is no prohibition whatsoever against images of the prophets in the Qur'an. The closest one gets is Sura 21:52 where Abraham rebukes the idol worship of his people with the question "What are these statues to which you are devoted? "3 However, it isn't only the Qur'an that informs the religion of Muslims. Muslims must also rely on the traditions of Muhammad, as recorded in a series of books known as the Hadith. There are different Hadith for different factions of Muslims, but most Muslims are Sunni by far and their Hadith bans not simply depictions of Muhammad or the prophets, but any visual representation of any person or animal is forbidden! The prohibition on images in Islam is wide and sweeping. The Answering-Islam article notes that for some reason while images on a pillow are banned, Muhammad didn't have a problem with little girls playing with dolls.8 This makes little sense as the doll makers are certainly doing the same thing as sculptors or pillow manufacturers. Also, most Muslims today don't seem to ban television or cameras from their homes. The ban on images is simply one more way to underscore the fragmented nature of the teachings of Islam. The press misunderstands the ban and in some ways helps justify the offense in the eyes of the west by limiting it to some kind of attack only on the holiest figures of the Islamic faith. That is a misrepresentation, since even a harmless depiction of an anonymous individual is not allowed. Choudary allowed the USAToday web site to publish his Op-Ed with images of people accompanying the piece. He also has his own web site that shows his picture. Such actions show the hypocrisy of his stance. 1. Choudary, Anjem. "People Know the Consequences: Opposing View." USA Today. Gannett, 08 Jan. 2015. Web. 08 Jan. 2015. http://www.usatoday.com/story/opinion/2015/01/07/islam-allah-muslims-shariah-anjem-choudary-editorials-debates/21417461/. 2. Burke, Daniel. 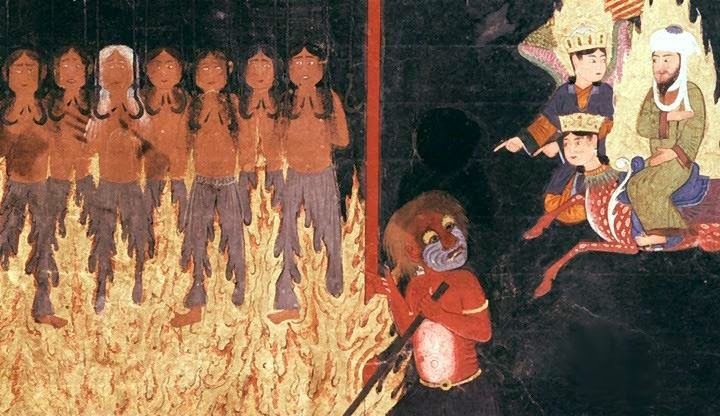 "Why Islam Forbids Images of Mohammed." CNN. Cable News Network, 8 Jan. 2015. Web. 08 Jan. 2015. http://edition.cnn.com/2015/01/07/living/islam-prophet-images/index.html. 3. "Surat Al-'Anbyā' (The Prophets) - سورة الأنبياء." Qur'an.com. Qur'an.com, n.d. Web. 08 Jan. 2015. http://quran.com/21/52. 4. Hadith, Sahih al-Bukhari, Book 72, Number 844. Center for Muslim-Jewish Engagement. University of Southern California, n.d. Web. 08 Jan. 2015. http://www.usc.edu/org/cmje/religious-texts/hadith/bukhari/072-sbt.php#007.072.844 . 5. Hadith, Sahih al-Bukhari, Book 72, Number 833. Center for Muslim-Jewish Engagement. University of Southern California, n.d. Web. 08 Jan. 2015. http://www.usc.edu/org/cmje/religious-texts/hadith/bukhari/072-sbt.php#007.072.833 . 6. "Are Pictures of Muhammad Really Forbidden In Islam?" Answering Islam. Answering Islam, n.d. Web. 08 Jan. 2015. http://www.answering-islam.org/Muhammad/pictures.html.